Ramkund is the symbol of our ancient culture, art and tradition. This is the oldest temple in Poonch region. As per the archaeological report, this beautiful temple was built by Raja Lalitaditya (i.e. between 724 AD and 761 AD) because the style, architecture and the age of the temple is the same as of those temples built by Raja Lalitaditya in Kashmir. This temple, having a very attractive look and history, is embedded in the past. It, however, remained out of sight due to locational disadvantages. Now this old shrine is regaining its erstwhile status. As per Raj Taringni of Kalhana, there is a very interesting story behind the construction of this temple. Kalhana narrates that Raja Lalitaditya who was a great warrior and had converted Poonch town into Chawani (cantonment) of his forces, named this places as Purn-Utsva (with the passage of time, this name became Poonch from Purn-Utsva) Kalhana writes that once Raja Lalitaditya left for hunting in the jungle, he reached this place in the evening. At this very solitary place, he saw in the nearby a girl singing a devotional song while a beautiful girl was dancing in this uninhabited place. When the song was over, both the girls bowed their heads at this place and left. The next day also, the same ritual was repeated by the same girls. Then Raja Lalitaditya accested these girls and enquired from them why they were dancing and singing their devotional song at a lonely place in the jungle. The girls replied that they were Devdasis and doing so on the direction of their mothers and grand mothers. "This is our traditional job but we do not know the reason of our dancing at this place." Raja thought that this may be some 'sacred place.' Next day, he ordered for excavation of that particular place where the Devdasis were offering prayer in the evening. After some excavation, two old temples came to surface whose doors were shut. When Raja opened the door, he saw that two idols of Keshav were installed there. One the back of these idols, it was engraved that these idols were installed by Ramchander Ji during his visit to Kashmir. Raja Lalitaditya transported these idols to Kashmir along with him and he installed the idol of Ram Chander Ji in the temple of Vishnu Parihas in Parbaarspur, while the second idol was taken by the queen and she installed it in Chakrshveri temple. It appears that while removing the original idols from Ramkund temple, Raja Lalitaditya got renovated or reconstructed the original excavated monument with some additions and converted this place into an important religious shrine. 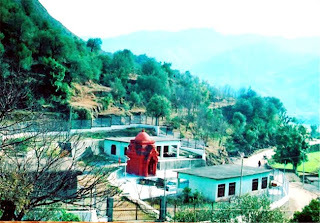 No doubt that Raja Lalitaditya had built Poonch city but at present, there is no such building existing on the ground belonging to Lalitaditya's time except Ramkund temple Mendhar. This is the only temple in this region which refers to the construction made by Lalitaditya.